Apple”s iOS devices like your iPad or iPhone are always smooth as butter with the impressive finger touch interface and the one of a kind user experience, but as time goes by you will be noticing a decrease in the response to touch from your device, it will be lagging while you are playing a game for example or going through some huge Pdf file. This happened to me in my iPhone and iPad and each time it happened i discovered a new way to deal with it. 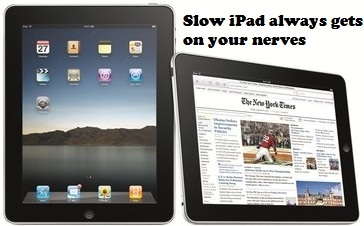 So here are some tips which will help you speed up your iPad or iPhone. Apps in the Multitasking tray are the apps which are running in the background and using up your RAM unnecessarily, So if a lot of Apps are On in the background then you need to close these apps to relieve your RAM of some unwanted burden. Click on “Edit” at the top left-hand corner of the screen to delete an entire conversation. Click on the recipient”s name and then select “Delete” to the right of the name. Click “Done” to return to the Messages main casino online menu. How to delete Specific Texts: Click on a recipient”s name to view all individual text messages sent and received between you and that recipient. Click “Edit” at the top right-hand corner of the screen to delete specific messages without deleting the entire conversation. Tap on the left side top of the message you want to delete, Click on the red “Delete” button at the bottom left-hand corner of the screen to permanently delete these messages. Out of excitement you will be downloading many apps from the app store which are never used after using it for the first time. So Apps like these should be deleted to relieve your memory which will speed up your PC. Your iPad and iPhone should be updated regularly as Apple will be releasing a Software update every now and then. Saving browsing caches helps with faster browsing experience, but as times goes on, it may become overload and cluttered. We recommend you to clear your iPad’s browser cache once per week to keep your browser clean and smooth. It is advisable to also clear the browsing History and Cookies on your iPad.